Position Summary The Northeast Document Conservation Center (NEDCC) is hiring a full-time Photographer to join the Imaging Services department. 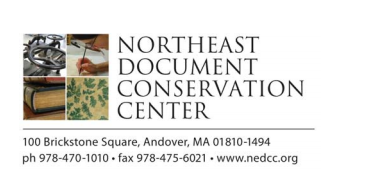 Founded in 1973, NEDCC is a not-for-profit conservation and preservation services center, supporting the collections of its private and institutional clients through book, paper, and photograph conservation, digital reformatting, and preservation assistance. The successful candidate will be joining a team of experienced and productive photographers, and will benefit from working alongside conservators and specialists dedicated to the treatment and care of the range of objects the Imaging Services department digitizes. The Photographer will be charged principally with the digital reformatting of the extensive, diverse and unique collections held by NEDCC’s institutional and private clients. These include virtually all photographic media, particularly nitrate, acetate, and glass-plate negatives, X-ray film, and daguerreotypes; bound and loose manuscript material; rare books and illuminated manuscripts; and oversized items such as maps and blueprints. To this end, the Imaging Services department utilizes medium format and SLR digital camera systems; copystands; custom stations for imaging oversized, transmissive, and bound materials; Broncolor strobes; a GE X-ray film scanner; Epson wide format printers; Eizo displays; and a color managed workflow. While we are primarily Mac-based we also use PCs, and maintain our own network, server, and archive. Responsibilities Reporting to the Director of Imaging Services, the Photographer will:  As needed, establish ideal environmental conditions for digitally photographing a project’s specific material types.  Digitally capture archival and special collection materials.  Apply standard post-capture image adjustments such as rotation and cropping, neutralizing color, and inverting and enhancing negatives.  On a project-by-project basis, perform complex post-capture image adjustments and processing, including file stitching and digital restoration.  Print high-quality reproductions of digitally captured files.  Always strive for process and image quality improvements within individual projects.  Collaborate with colleagues to identify the most efficient workflows for digitizing materials safely, while also maintaining the highest standards of quality.  Track project status and submit daily production reports.  Adhere to NEDCC hours of service without exception.  Other duties as assigned. Qualifications  Bachelor’s degree in a related discipline.  Experience or training in the handling of rare and fragile paper-based materials.  1-3 years’ experience digitally reformatting archival and special collection materials or works of art.  Proficiency in the use of imaging hardware, particularly digital medium format and SLR camera systems, and flatbed or film scanners.  Knowledge of studio lighting equipment and techniques.  Experience using RAW workflow software such as Lightroom or CaptureOne, and editing software such as Photoshop.  Strong eye for color, value, composition, and visual accuracy.  Demonstrated ability to work under deadlines in a production-oriented environment.  Ability to work both independently and collaboratively.  Exceptional problem solving skills.  Meticulous attention to detail.  Enthusiasm and creativity. Creating, modifying, or updating records in DAMS and TMS. If interested in the contracting position, please send résumés to feldmanc@si.edu. We are gathering a pool of applicants and will be in touch with those whose résumés indicate they are the best fit for the position.